This poem featured in our childhood a lot. Dad would quote it often. He was a shearer when he was younger and would tell us tales of shearing all over Western Australia. This was in the ten years before he and Mum were married in 1958. 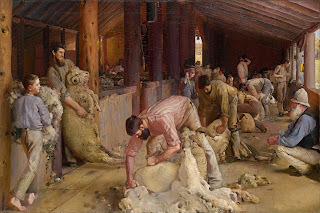 The story of how he travelled to the east with a shearing team and discovered when he got there that the "wide comb dispute" was in full swing. Not wanting to be a 'scab' he moved on from shearing to working on the Victorian side of the 'Snowy Hydro electric scheme" as a 'raceline skier'. My parents were married in Mount Beauty and then travelled back to WA. In quavering tones he said “Oh deary me! Tom Roberts - "Shearing the Rams"